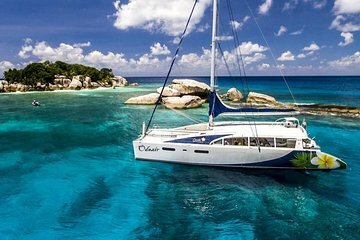 Explore the Seychelles' Marine Park on this full-day catamaran cruise from Victoria. You can be ready for hotel pickup with just your bathing suit and towel, as everything is provided on board for you. Relax and enjoy the scenery while enjoying snacks and a barbecue lunch with live music in the background. Toast your adventure with a farewell cocktail at the end of the day.